If you are a first time client, we will personally meet with you and your pets in your home during a free initial consultation that will generally last 30-90 minutes. During this meeting, we will go over your pets’ daily routine, feeding regimen, medications, and any special needs your pets may have. You will help us determine schedules for pet feeding and walking and we will have an opportunity to interact with your pets so that they are familiar with us before the initial pet sitting/walking visit. Please be prepared to entrust us with two copies of all keys needed to access your house and/or barns at this visit: one will stay with Joanna, and one will be kept in a secure location in case of an emergency or loss of the primary key. Keys are coded with the initials or partial names of one or more of your pets, and will not be traceable back to your home. This initial consultation is REQUIRED for all new clients, so please contact us well in advance of your needs to insure availability for the dates you need and ample time for scheduling the consultation. *If less than 7 days notice is given for requested dates by a new client or if additional consultations are necessary when less than 6 months have elapsed between bookings, a consultation fee of $20 may apply at Woof to Hoof’s discretion. All pet sitting services include: feeding and watering, play time or a walk, medications as needed and within reason, litter box cleaning and disposal, daily text/picture messages or email updates, and lots of love and belly rubs! All pet sitting services also include the following home care and communications at no additional charge: text or email updates with or without photos; lights on/off; indoor/outdoor plants watered; mail/newspaper collection; and trash/recycling taken to the curb and cans returned to normal storage area. Need something else? Just ask! This service is handy when you go on vacation or otherwise will be absent during your pets’ normal feeding time. These visits are also great if you work long hours and your pet needs a midday potty break! Visits generally last 20-30 minutes, but we emphasize quality over quantity and often spend more time when available to give your pet extra love and attention. $20/visit, <30 minutes, mileage may apply. 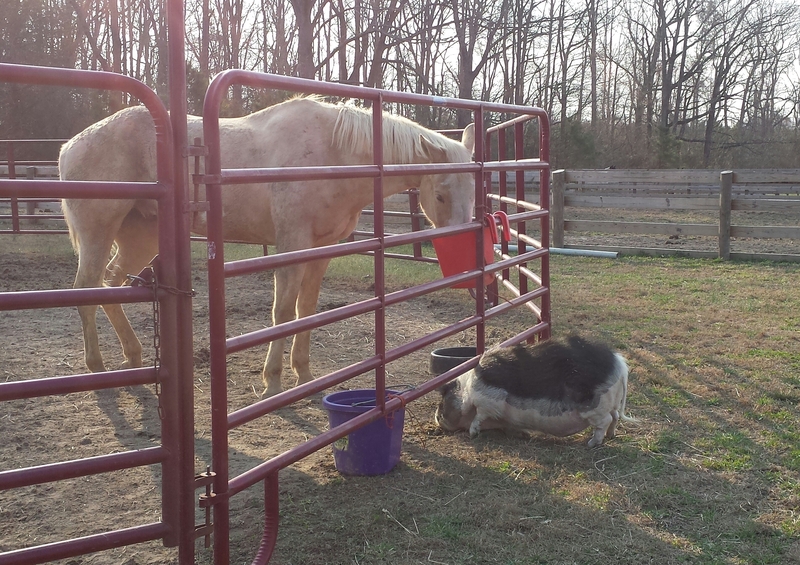 Whether you have one horse in your backyard or a farm with horses, cattle, chickens, and more, Woof to Hoof is happy to take care of all your critters while you are away. Because farm needs vary so widely, use the Contact Form or send us an email to provide us with your basic information and set up a Complimentary Consultation. Please include your address, the number and types of pets that you have, and specific feeding times/requirements. Overnight Care includes (if applicable) Night Check for horses/Potty Break for dogs/Late Dinner and Breakfast with the Overnight period, and the sitter will normally be in your home continuously from 9/10 PM – 6/7 AM. Your pet will receive lots of attention and (if allowed and normal for your pet) enjoy sleeping with the sitter. If you need the sitter to stay in your home during the day or if visits are needed between the hours of 6/7 AM and 9/10 PM, additional charges will apply. 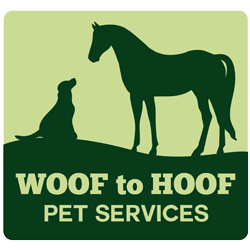 Woof to Hoof Pet Services reserves the right to invoice/bill, at $20 per half hour or any portion thereof, for additional time spent over a 30-minute or 60-minute visit that is necessary for the care of your pets and/or home. This includes service and time for the following, but is not limited to: veterinary trips; excessive cleaning due to pet incontinence, vomiting, or accident; obtaining pet food or supplies; searching for and capturing pets that have escaped their enclosures; waiting for and assisting emergency service provider such as a large animal veterinarian or farrier; additional trips deemed necessary for the health and well-being of pets during illness or severe weather. The balance for any additional services is due within 14 days of receipt of invoice. Key Pickup/Return – No charge if picked up at the time of Complimentary Consultation. Otherwise, $15 per trip at Woof to Hoof’s discretion. Holidays are a special time and just like you, we enjoy spending time with our friends and family. For this reason, and because of the high demand for our services during major holidays, a service fee of 50% of the normal fee (overtime), not to exceed $30/day, will be added to each visit for the following holidays AND holiday weekends if a holiday falls on a Monday or Friday: New Year’s Day, Memorial Day & Weekend, Independence Day & Weekend, Labor Day & Weekend, Thanksgiving, Friday after Thanksgiving, and December 20 – January 1. Woof to Hoof Pet Services accepts payment in the form of check (made out to Woof to Hoof Pet Services), direct deposit, or cash. For all clients, a deposit of 50% of the total fee is due at the time of booking, and the balance is due on or before the first date of service. For new clients requesting overnight care, a deposit of 100% of the total fee is due at booking. Please refer to our Policies page for information about cancellations and refunds. Do you occasionally need help while you are home? We are able and willing to help clients with routine farm maintenance, medication of animals (vaccinations, deworming, wound care, bandaging, etc. 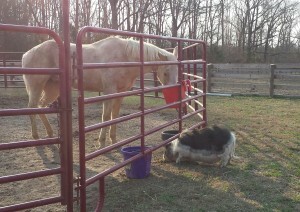 ), farrier/vet appointments when you cannot be home, etc. Do you have a special need? Just ask! If you are leaving your farm for an extended period of time and don’t want your horse(s) to lose condition, these options may work well for you. Additionally, if you have a horse that you need brought back up to speed or conditioned for sale, Joanna may be able to help you. All horse exercise services include grooming, tacking, untacking, and cooling out. Specialized services and packages available.